In Spain, eggs can be served any time, including as tapas to accompany drinks. 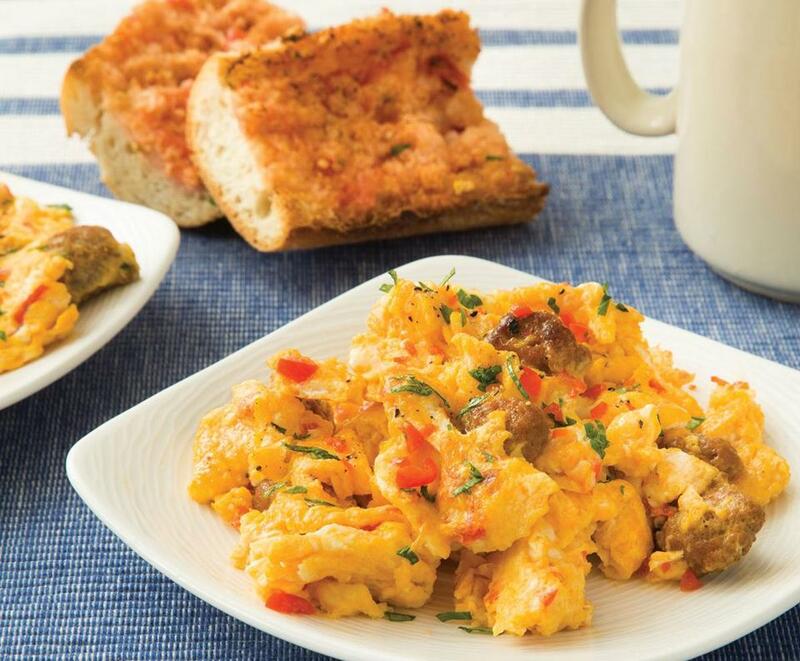 Scrambled eggs with chorizo and piquillo peppers. Though breakfast in Spain is generally a modest affair, Spaniards also enjoy eggs for lunch and dinner, and as tapas served with drinks. The thick potato omelet called tortilla Espanola (or tortilla de patatas) is a popular fixture on Spanish tables and bars, while revueltos, scrambled eggs with various additions, runs a close second. Here we have two characteristically Spanish revueltos accompanied by pan con tomate, a simply toasted bread drizzled with olive oil and rubbed with garlic and fresh tomato. Choose precooked (soft) chorizo, not the hard, salami-like one or the Mexican type, which is fresh and uncooked. Whether you go with hot or sweet is up to you. In my experience, a 10.2-ounce jar of Pastene fire-roasted piquillo peppers holds seven or eight peppers, so one jar will more than cover your needs for the recipe. Note that the eggs cook quickly here because the pan is already very hot from sauteing the chorizo and piquillos. In a 10-inch, nonstick skillet over medium heat, heat the olive oil until shimmering. Add the chorizo and cook, stirring, until it begins to brown at the edges, about 4 minutes. Add the piquillo peppers and continue to cook, stirring, about 4 minutes longer. Meanwhile, use a dinner fork to beat the eggs in a medium bowl with 1/2 teaspoon each salt and ground black pepper until blended and uniformly yellow (don’t overbeat). Add the eggs to the skillet and cook, without stirring, for 20 seconds. Continue cooking, constantly scraping along the bottom and sides of the skillet with a flexible heatproof spatula and folding the eggs in large strokes, until clumped in large, moist curds, 2 to 2½ minutes longer. Off the heat, add most of the parsley and stir to distribute it. Adjust the seasoning with salt and ground black pepper, if necessary, and serve at once on warmed plates, sprinkling each serving with some of the remaining parsley. With a noticeable hit of garlic, some may find these eggs better suited for midday or evening. If you want them for breakfast but prefer your mornings garlic-free, leave it out, or replace it with 1 teaspoon smoked paprika. Like the recipe with the chorizo and piquillo peppers, the eggs cook quickly because the pan is already very hot from sauteing the potatoes. In a 10-inch, nonstick skillet over medium heat, heat 1½ tablespoon of the olive oil until shimmering. Add the potatoes and 1/4 teaspoon salt, stir to coat the potatoes, spread them into a single layer, and cook, stirring occasionally (and re-spreading them into a single layer after each stir), until tender and well browned, about 15 minutes. Add the garlic and cook, stirring, until fragrant, about 40 seconds. Meanwhile, use a dinner fork to beat the eggs in a medium bowl with 1/2 teaspoon each salt and pepper until blended and uniformly yellow (don’t overbeat). Scrape the potatoes to one side of the skillet, add the remaining 1½ teaspoons olive oil, allow it to heat for a moment, and tilt the skillet to coat the cooking surface. Add the eggs and cook, without stirring, for 20 seconds. Continue cooking, constantly scraping along the bottom and sides of the skillet with a flexible heatproof spatula to fold the eggs in large strokes and incorporate the potatoes, until the eggs begin to form curds, about 1½ minutes. Sprinkle the cheese into the eggs and continue to cook, scraping the bottom of the skillet and folding to incorporate the cheese, until the eggs are clumped into large, moist curds, 1 to 1½ minutes longer. Off heat, add most of the parsley and stir to distribute it. Adjust the seasoning with salt and pepper, if necessary, and serve at once on warmed plates, sprinkling each serving with some of the remaining parsley. To give the bread for pan con tomate a rough surface to catch plenty of garlic and tomato bits, I like to split it open with a fork (just as I did with English muffins as a kid) for pronounced nooks and crannies. So simple that it’s more of a technique than a recipe, toasted or grilled bread rubbed with garlic and tomato is a Spanish classic. A great snack on its own, pan con tomate is also a wonderful partner for saucy dishes; Spain’s fantastic hams, sausages, and cheeses; anchovies and tuna; and of course, for scrambled eggs. 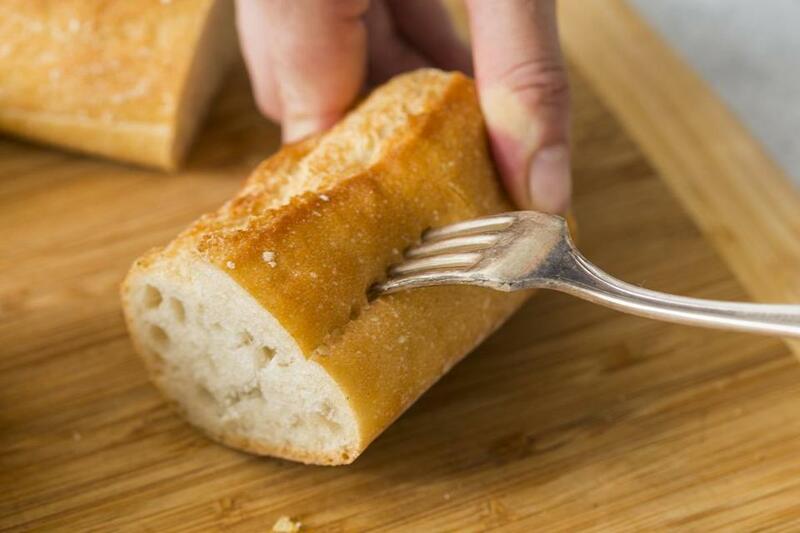 Any good, sturdy country or peasant-style bread works, but I like a baguette especially because it’s easy to split with a fork (see tip), creating a rougher surface to catch garlic and tomato. Here I toast the bread, but you can grill it instead. Whatever you do, make sure the bread is not soft and fluffy. Toast the baguette pieces until the crumb sides are golden brown and crisped. Swipe the toasted side of each piece several times with the garlic clove, switching to the second clove once the first one has worn down to a nub that’s difficult to hold. Brush each with olive oil to taste. Swipe each one several times with a tomato half, sprinkle lightly with salt, drizzle lightly with more olive oil if desired, and serve. Adam Ried appears regularly on “America’s Test Kitchen.” Send comments to cooking@globe.com. Get the best of the magazine’s award-winning stories and features right in your e-mail inbox every Sunday. Sign up here.